Several years ago, I wrote an article on using Elmer to solve complicated physics problems. Elmer has progressed quite a bit since then, so I thought it would be worth taking a fresh look at this simulation software. Those steps will conflict with the Elmer packages that exist in the main Debian repositories, so be sure that they haven't been previously installed on your system. The meta-package elemerfem-csc also will install a number of sample files that I use here as part of my description of Elmer's functionality. The first step is to start Elmer. Depending on your desktop environment, there may be an entry within the menu system. If there isn't, open a terminal and start it with the command ElmerGUI. 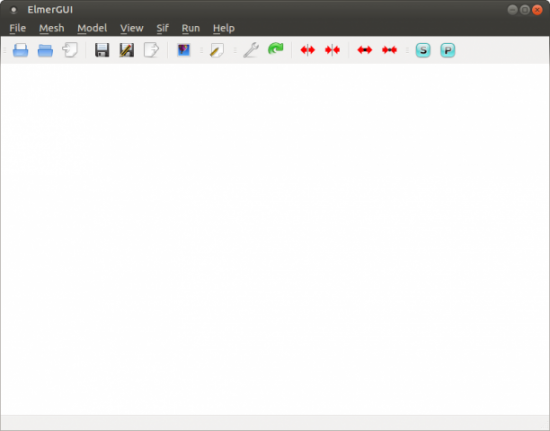 This command opens the application and leaves you with an empty workspace. Figure 1. Executing ElmerGUI starts the main application, which controls all the other steps involved in using Elmer. Most programs that solve physics problems of this type follow three broad steps. The first, or pre-processing, step involves preparing the problem for solution. This includes defining any materials and their properties, along with any equations that describe the processes that will be taking place. 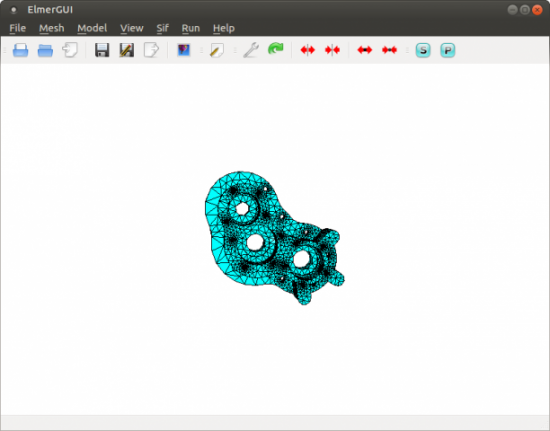 This is also when you would apply a meshing function to break the geometry down into the subsections that will be used during the actual calculation phase. The second, or solver, step is when the input data is supplied to the actual solver functions that apply the equations to the materials described in your problem. The last, or post-processing, step is where you find the solution to your problem. Humans interpret graphical information most easily, so there are tools available in the post-processing step to visualize the final solution and help you see the results of your problem. Since Elmer's installation includes a number of sample files, let's go ahead and use those to explore what kind of work is possible with Elmer. These files should all be available in the /usr/share/ElmerGUI/samples directory, subdivided by the types of files contained within the samples. Let's look at the heat distribution across a pump section and see how the distribution happens. To start, you will want to open the pump_carter_sup.stp step file, which is located in the step subdirectory of the samples directory. When you open this file, it gets loaded into the ElmerGUI geometry viewer. Figure 2. 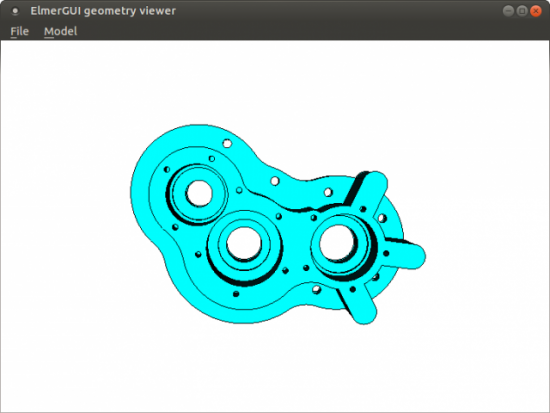 The ElmerGUI geometry viewer allows you to see the object you'll be using during your calculations. This viewer allows you to grab the object with your mouse cursor and rotate it around, so you can get a good look at it and make sure it's structured properly. This object also is meshed automatically by ElmerGUI, so that it can be used in the solver stage. Figure 3. ElmerGUI also can handle meshing your objects in the pre-processing step. Here, you can see the set of triangles that have been mapped onto your object to define the domains on which the solver should operate. You can verify the actual meshing by clicking the Model→Summary menu item, and look at the top of the output for the summary information. Figure 4. The model summary tells you things like the number of nodes, edges and volume elements within your model. 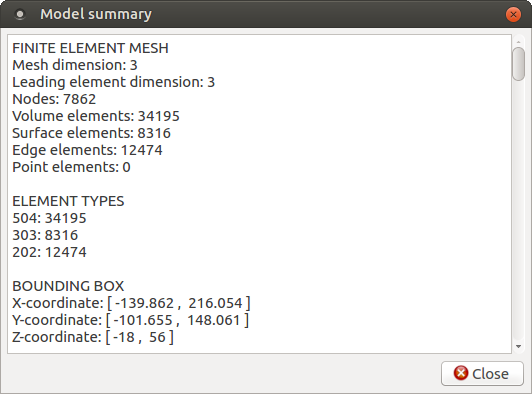 In this case, you can see that the meshing created 7,862 nodes and 34,195 volume elements. If this isn't fine enough to handle the accuracy you need, you can click the View→Cad model menu item to bring up the geometry viewer again and then click Model→Preferences. If you do make any changes, don't forget to click Mesh→Remesh to redo the meshing process. This may take some time if you are adding a significant number of subsections. Now that the object is loaded, let's start setting some initial conditions. For this example, you want to set the temperature on the inside surfaces of the three holes. You can select surfaces by double-clicking on them. If you need to select multiple surfaces, simply hold the Ctrl key down at the same time. Since you want to treat these three surfaces as a single unit, you'll need to unify them. You can do this by clicking the Mesh→Unify surface menu item. To set initial conditions for the entire problem, click the Model→Setup menu item. Figure 5. The model setup window allows you to set initial conditions for the entire model as a whole. Here you can set input and output locations, constants, numbers of iterations or time step procedures, among many other options. You also need to add the equations that will define the physical processes you actually are trying to solve for. Clicking Model→Equation→Add opens an editing window to create a new equation. Figure 6. You can add equations to define the physical processes you are trying to model. In this case, let's just add a heat equation to calculate how heat flows through this pump part. Since you need to apply this to the entire object, you can click the apply box for Body 1 here in the equation editor. But, what kind of object is this? Clicking Model→Material pops up a window where you can define all the physical properties of the object. Figure 7. You can set all of the physical properties of the materials used within your object. There also is a button called Material library that allows you to select from a set of predefined materials. In this case, let's set the object to be aluminum. 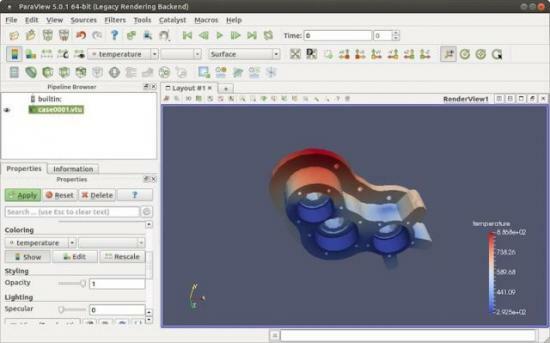 As with the equation editor, you can apply the material type to the object directly here. 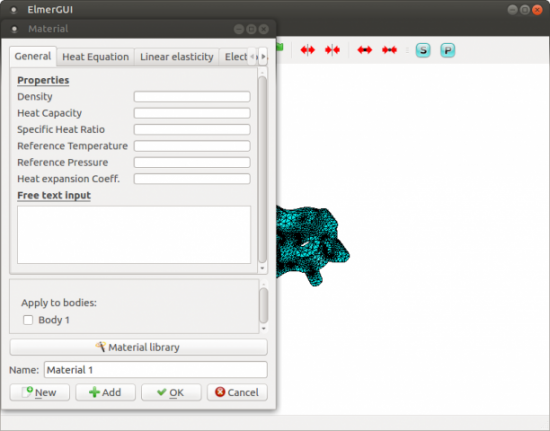 Clicking Model→Body Force pops up a window where you can enter values that would represent the right-hand side of the equations. Figure 8. You can set body forces that define forcing values for the equations being used. Clicking the Model→Boundary Condition menu item will pop up a new window where you can set boundary conditions for your equations. Figure 9. 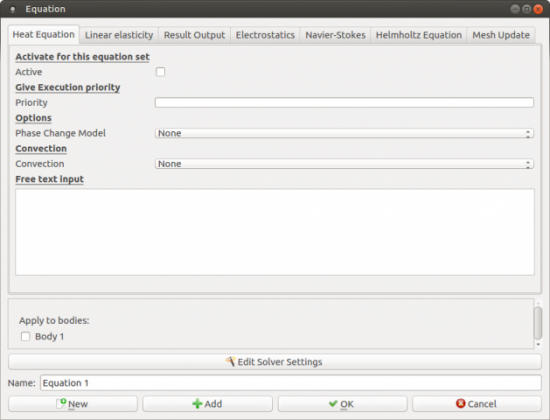 You can set boundary conditions for your equations to be used by the solver stage. In this case, say you want to create a new boundary temperature of 293°Kelvin, which is named RoomTemp. To apply this boundary condition, go back to the main ElmerGUI interface and double-click the surface of the inside of the holes again. 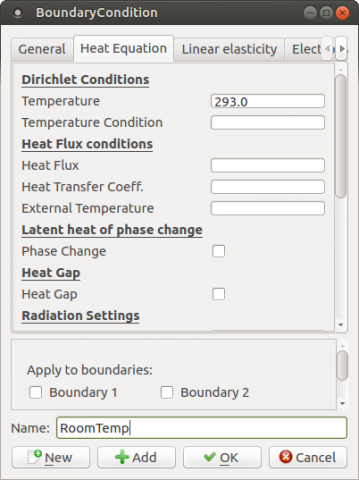 A small window will pop up asking you to set a boundary condition, where you can select the RoomTemp condition that was just set. Figure 10. Select the sections that need to have a boundary condition applied to it. 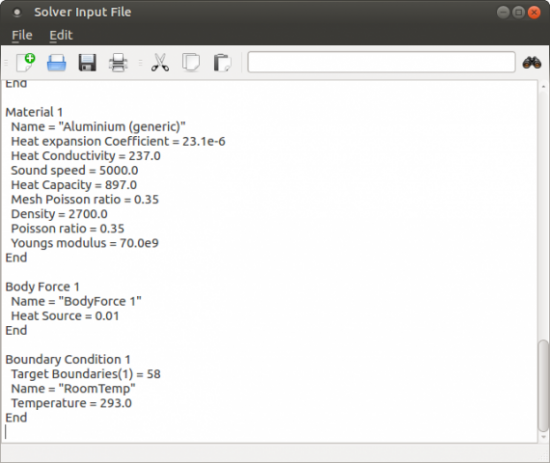 In order to run the solver, you need to generate the final input file. You can do this by clicking the Sif→Generate menu item. If you want to take a look at it, click Sif→Edit to pop up an editor window. Figure 11. You can open an editor to manipulate the solver input file directly. You also will need to save the entire project so that all of the required files are in a single location before starting the solver. Now, click Run→Start Solver to start the whole process. Once it's done, you'll see some new output windows. The top one is the convergence monitor, showing you how quickly the solver came to the final solution. Figure 12. 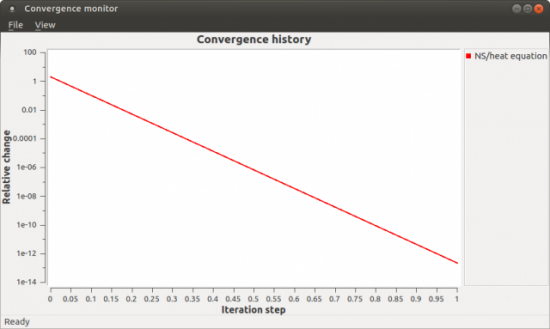 After the solver is done, you'll see a window showing how quickly convergence happened. You can visualize the results in the post-processing step. In this example, click the Run→Start ElmerVTK menu item to get one type of visualization. If you also installed paraview, you can get a very sophisticated visualization application to look at your output files. Figure 13. Paraview can provide sophisticated visualization tools for your output files. This article was just a walk-through of one of the sample problems to show a small cross-section of the available functionality. I hope this article has whetted your appetite enough to look at the other sample problems and use them as a jumping-off point for your own research interests.